Keeping your Honda engine healthy is an imperative part of maintaining the quality, reliability and performance of your engine. We choose our Honda Dealers and Registered Service Dealers with the same care as we put into building our product. You can trust that only high quality Honda Genuine Parts are used, so that your Honda engine will perform as it was engineered to. Leave your product in the hands of those most familiar with the level of performance expected from a Honda. Our dealers are supported by our Tech-line and Quality Engineering teams at Honda Canada Inc.
180 Honda Boulevard, Markham, Ontario for and on behalf of Honda Motor Co. Ltd., Tokyo, Japan, gives the following written warranty on each new General Purpose Engine manufactured by Honda Motor Co. Ltd., Japan, distributed in Canada by Honda Canada Inc. and sold as part of the original equipment of machinery or equipment when such machinery or equipment is manufactured in Canada. Whenever used herein, the word "Honda" refers to Honda Canada Inc. and/or Honda Motor Co. Ltd. as appropriate from the context. each new Honda General Purpose Engine will be free, under normal use and maintenance, from any defects in material or workmanship for the relevant warranty period set forth below. 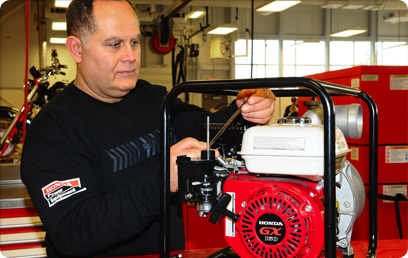 If any defects should be found in a Honda General Purpose Engine within the relevant warranty period, necessary repairs and replacements with a new part or the Honda equivalent shall be made at no cost to the consumer for parts and labour (except for labour charges due to the presence of an attachment), when Honda acknowledges that such defects are attributable to faulty material or workmanship at the time of manufacture. Warranty coverage commences from the original date of sale or when the unit is first put into use as a demonstrator. The following warranty applies to power products purchased at retail or placed into rental service on or after August 1, 2011. NOTE: CONCESSION USE REFERS TO GO KARTS ETC. a) Any Honda General Purpose Engine purchased from a Honda general purpose engine dealer or distributor authorized to sell that product in Canada. c) Any General Purpose Engine on which required maintenance services have been performed as prescribed in the Owner’s Manual. a) Any repairs required as a result of collision, accident, striking any object, racing, misuse or lack of required maintenance. b) Any repairs required as a result of any attachments, parts or devices installed by or repairs done by a party other than the Original Equipment Manufacturer or an authorized Honda Power Products dealer. c) Any Honda General Purpose Engine modified, altered, disassembled or remodelled. d) Normal maintenance services, including tightening of nuts, bolts and fittings and engine tune-up and the replacement of parts made in connection with normal maintenance services including filters, spark plugs and wires, fuses, belts, lubricants and other expendables susceptible to natural wear. In order to maintain the validity of this DISTRIBUTOR’S WARRANTY, the required maintenance services as set forth in the Owner’s Manual must be performed at the proper intervals and detailed receipts and records retained as proof. You must take your Honda General Purpose Engine, at your expense, during normal service hours, to the authorized Honda Power Products dealer or the dealer designated by the manufacturer of the machinery or equipment powered by the Honda engine. If you are unable to obtain or are dissatisfied with the warranty service you receive, first contact the owner of the dealership involved; this should resolve the problem. If you require further assistance, contact the Honda Canada Inc., attention Customer Relations Department. New genuine Honda replacement parts sold to a consumer or installed by an authorized Honda power equipment dealer which are not covered by the DISTRIBUTOR’S WARRANTY are warranted for a period of one year from date of purchase for normal use, or 3 months for rental or concession use provided, however, that this Replacement Parts Warranty does not apply to any replacement parts modified, used with, or installed on a power product for which the replacement parts were not intended. Electrical components that are not installed by the dealer (sold over the counter) are not covered by warranty. This DISTRIBUTOR’S WARRANTY is the only and the entire written warranty given by Honda for Honda General Purpose Engines. No dealer or his agent or employee is authorized to extend or enlarge on these warranties on behalf of Honda by any written or verbal statement or advertisement. To the extent the law permits, Honda disclaims any responsibility for loss of time or use of the General Purpose Engine, transportation or towing costs or any other indirect, incidental or consequential damage, inconvenience or commercial loss. The provisions contained in these written warranties are not intended to limit, modify, take away from, disclaim or exclude any warranties set forth in or the operation of The Consumer Products Warranties Act, 1977 (Saskatchewan), The Consumer Product Warranty and Liability Act (New Brunswick), The Consumer Protection Act (Quebec), or any other similar provincial or federal legislation. The owner information submitted may be used by Honda and its related companies, their dealers and service providers to communicate marketing, product and service information to you. If you prefer not to receive marketing information, please contact us at 1 -888-946-6329.